I wanted to round off the year on my blog with a look through some of my reading highlights of the year and some aims for the upcoming one. I hope you enjoy reading as much as I’ve enjoyed making this post! The Colour of Bee Larkham’s Murder – Sarah J. Harris’ novel is unlike anything I’ve read before. A story of betrayal and murder, yes, but embedded within a narrative of a young boy doing his best to understand a world that he cannot see clearly, and that is also refusing to understand him. Phenomenal writing and plotting made this book a real page-turner. The Rules of Seeing – Joe Heap’s debut novel was fascinating. I was particularly invested in Nova’s story – a woman learning to see for the first time, recalibrating everything she’d previously done to navigate through the world. Alongside that was the exploration of her relationship with Kate, and all the unexpected occurrences that result from it. Some parts were rather dark, but overall this was a beautiful, heart-warming novel. An Unremarkable Body – I am still stunned by this book by Elisa Lodato. The portrayal of grief is one of the most raw and real I’ve ever come across in a book. Laura’s efforts to process and then move on from her mother’s death were so relatable to me, so sensitively and accurately portrayed. Adding the mystery elements worked for me, lifting it to a different level. Homegoing – Yaa Gyasi’s multigenerational narrative of trauma, loss, injustice, and resilience is stark and lyrical simultaneously. The effects of the horror of slavery are felt across continents and eras, mirroring the powerful impact of storytelling and legacy from one generation to the next. This book really is a masterpiece. The Woman in White – a ‘classic’ that took me most of the year to read. It’s a tome, but it was worth getting through in the end. The intrigue built up throughout was compelling, as were the central characters. It read very much like a predecessor of the popular detective stories that would captivate readers in the latter years of the nineteenth century. It was incredible. I really thought I’d achieve my Goodreads goal of 50 books this year but alas, I was short by 5 books. I had a few really bad slumps and some periods that were so hectic, I just about had time to eat and sleep haha, let alone read. I’m still very proud of my reading this year! I’ve mainly read books from the Victorian period to the present day, and but have mainly stuck to my preferred genres of historical fiction, crime thrillers, and literary fiction. For 2019, I’d love to read more of other genres, and try to fit in some non fiction as well, as there are so many fascinating subjects being written about. I also want to read further beyond the standard English/American writing than I have done before, whether that be works in translation or written in English. I want to make more use of my audiobook subscription as I’ve let my ‘listening’ slide a lot this year (Harry Potter revisits aside). I’m still listening to Michelle Obama’s ‘Becoming’ (it is so good to hear her voice narrate her varied life experiences) but I’ve found it so hard to concentrate on audiobooks generally that I’ve avoided downloading many. I’ve made excellent use of the library this year, particularly in the last few months when relocating for work meant that book-buying wasn’t feasible. My new library has an excellent range of titles on offer, from classics to the latest hardback releases. I’ve yet to try their ebook borrowing service, but it looks so good. Libraries really are magnificent resources so I’m excited to see what new reading material I find there throughout 2019. My main goal for reading in 2019 is to read widely, but not put pressure on myself to finish books I’m not enjoying or to read as many books as possible. 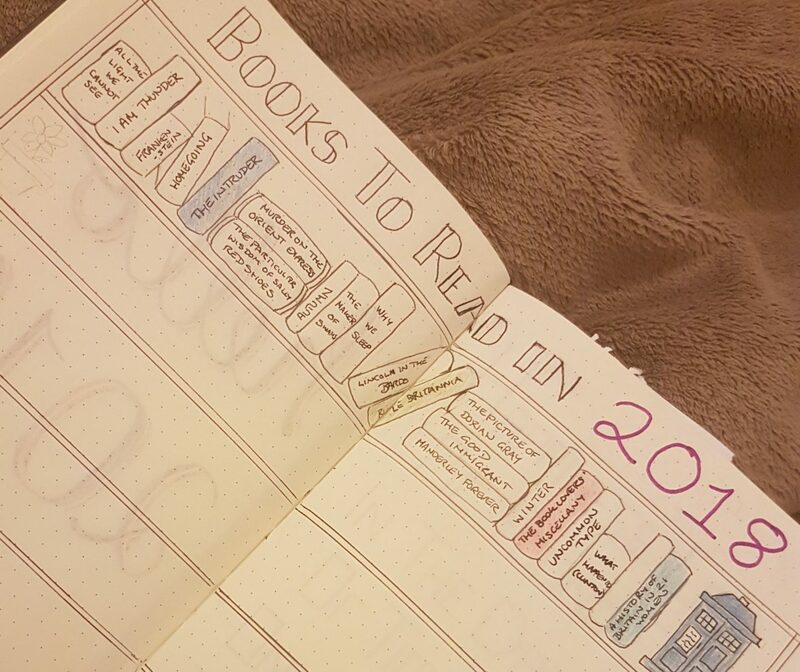 I really want to get into a better routine of writing and posting on the blog, and on Instagram and Twitter, so I’m going to make use of one of my many empty notebooks to plan plan plan! Again, I don’t want to put pressure on myself because life is what it is and I can’t spend all my days reading and blogging. But I want to get things scheduled better so there aren’t weeks between posts. The final thing I want to say is a huge thank you to you all for following my blog, for all the likes and discussions we’ve had. I adore following your reading journeys and I’m very grateful that you’ve chosen to follow mine too. Thank you for your post. I enjoyed reading your “reading goals” and have decided this year to explore some Japanese literature/ novels – this will be an expansion for me !